HOW ARE YOU PROTECTING GOVERNMENT DATA? 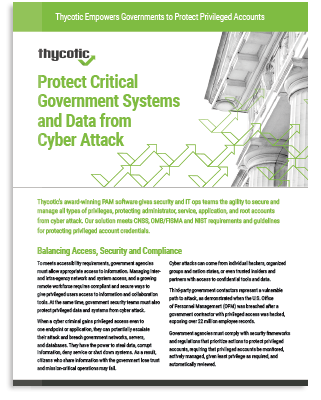 Thycotic’s privilege management gives federal agencies and government contractors simple, automated controls to secure confidential information, and to meet the US Department of Homeland Security CDM requirements. Malicious threat agents and state-sponsored attacks are targeting federal government IT systems. Attacks can disrupt mission critical operations, corrupt or steal classified information, and deny essential services. Privilege management secures access to data and systems to prevent and defend against cyber attacks. When hackers stole 22 million records from the Office of Management and Budget it was the largest data breach in U.S. government history. This cyber catastrophe gave us a glimpse of the scope of potential attacks on government systems. Although awareness of cyber risk is higher than ever, federal agencies still struggle to secure legacy IT systems with weak security controls and scarce security resources. The most sensitive data and critical IT systems managed by the federal government are accessible to anyone with the right credentials. Privileged management solutions, including role-based access control, encryption, multi-factor authentication and enforcement of a least privilege policy, are an essential part of a cyber security strategy for all federal agencies and contractors. Federal agencies as well as contractors that wish to do business with the federal government must abide by key cyber regulations. These security rules mandate how access to sensitive data and systems must be managed and audited to minimize the risk of a cyber attack. 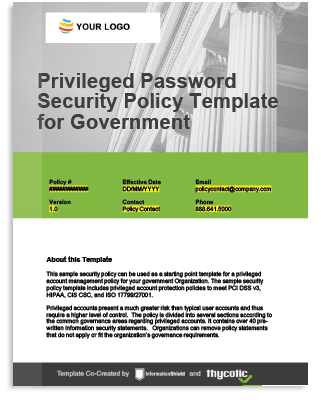 Government privileged account credentials are a prime target of hackers, so it’s critical that you put password protection policies in place to prevent unauthorized access to government data, and demonstrate cyber security compliance. Learn more about how Secret Server meets requirements for government-use IT security products. When government insiders have privileged access to information they are vulnerable to cyber attack. Insiders with privileged credentials may find ways to skirt security controls in an effort to get their jobs done more quickly. Foreign entities could use social engineering to recruit them—wittingly or unwittingly—for cyber espionage. 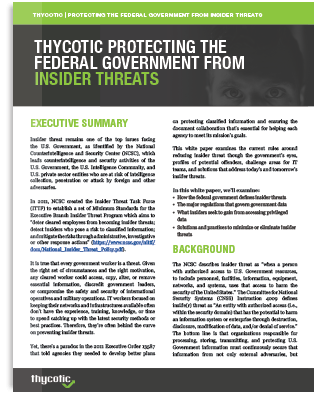 Learn how Thycotic helps federal agencies reduce the risk of insider threats.